We manufacture the best folding scissors gates available for commercial applications, at a cost that provides the best value in the market. 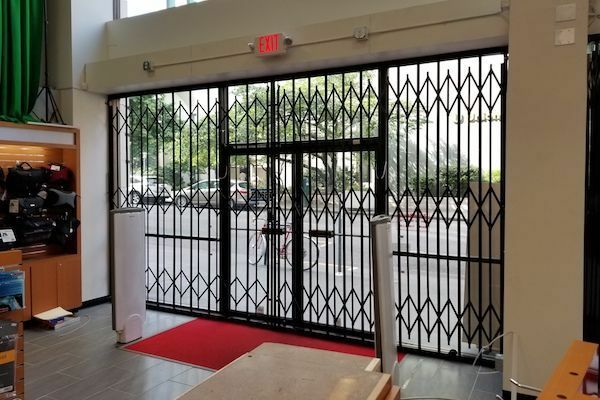 Below are the two types of folding gates available for commercial installations. 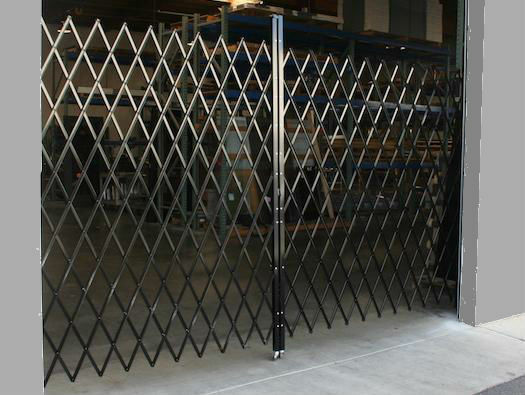 MaxGuard folding scissor gates are the most rugged and secure gate available for non-business hour security. 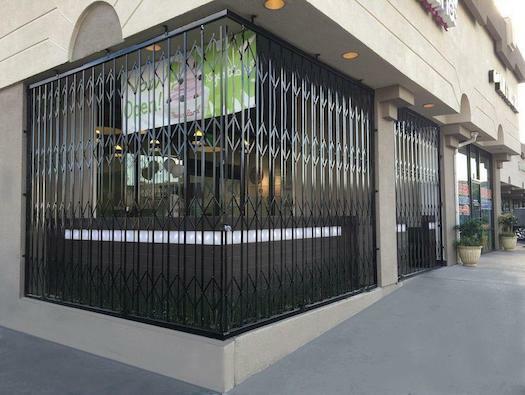 These gates are typically used for storefronts to protect against window break and enter. These can be mounted on the inside or outside of the window area, depending on the preferred exterior or interior building aesthetics. This rugged design provides tracks on top and bottom to maximize security. The bottom track is designed to fold up at the business entry door during business hours for convenience and attractive aesthetics. Easy Glide folding gates are lightweight gates for perimeter security during business hours. These are generally used for daytime perimeter deterrents for non-employees, typically used for warehouse dock security. Dock gates are typically bolted to each side of a dock door for vertical support. This mounting style provides a self-standing easy-to-use gate. Warehouse gates do not utilize tracks, each self-standing folding gate-half rolls on one wheel, providing a lock loop in the center for access control. These gates are often needed for retail warehouse aisle restriction, keeping customers out of aisles when forklift work is occurring. Our gate designs provide two key advantages, safety, and durability. Competitor’s scissor gates are often designed without safety in mind. The collapsing of the gate can pinch and injure fingers if the user isn’t careful. The special AC Folding Gates design helps to avoid accidentally pinched fingers with our special no pinch U-channel design. AC Folding Gates manufacture their scissor gates with high-grade materials, designed to provide up to twice the operational life of other cheap gates. This becomes important with self-standing gates in warehouse applications, becoming more prone to pinch injuries as they wear out. AC Folding Gates’ special rugged design provides years of safe, providing the best value available. Buy an AC Folding gate that’s safe, one that will last.